Home » What Are Trim Tabs On A Boat? What are Trim Tabs On A Boat? Most boats are designed to have perfect balance and run nice and flat across calm waters. When we start adding people, fishing gear, and the coolor to keep our sodas cold (and all of our adult beverages) we have most likely thrown that perfect balance of the boat off to the port or starboard side. Also, when the seas are not perfectly flat this can cause your perfectly balanced boat to run off kilter. The good news is there is a solution. We do not live in a perfect world of balance and calm seas therefore we counter act our balancing boat act with trim tabs. Trim tabs are normally made of aluminum and mounted to the stern of the boat. Each side of the boat has a trim tab mounted to the stern. Under normal circumstances trim tabs are flush with the bottom of a boat and have no impact to the ride or balance of the boat. When you encounter a situation where your boat is off balance trim tabs are there to help. The port and starboard trim tabs are controlled independently to help with either a port or starboard list. Pressing the starboard bow down button on your trim tab switch you are engaging the port side trim tab into the water and correcting a port side list pushing the starboard bow down. This works exactly the same for a starboard side list. 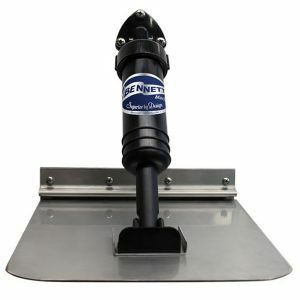 While balancing out your boat is one of the most common uses for trim tabs you can achieve other boating task using your trim tabs such as reducing sea spray when running into a quartering sea. Stay tuned to our blog for our next article on “Using Trim Tabs to Reduce Sea Spray”. If you are interested in more information regarding trim tabs or are interested in having us install trim tabs on your boat please visit our service page here to set up an appointment. You may also call our service department direct at 850-424-5994.